Network automation is critical for supporting the increasing application and workload needs of modern, digital business. 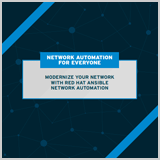 Red Hat Ansible Network Automation provides an automation engine, management, interface, and support offering—for better control over and visibility into network resources. As a result, businesses can improve infrastructure availability, staff productivity, network security, and configuration compliance. By 2021, productized network automation tools will be used by 45% of organizations, which is an increase from fewer than 10% today.